Excuse me, as I am way late on posting about this product. It actually wasn't under my radar, as I have strayed quite far from Asian beauty products and cleansers as of late. My skin hasn't really experienced any problems in a long time, but my skin is still experiencing some dry patches here and there. It's weird, I've never had problems like this until this past winter. Makes me very unhappy. When I saw Bubzbeauty raving about this product in one of her favourites' videos, I had to check it out. I ordered a couple samples from a seller on eBay, just to see if this product would deliver promised results. 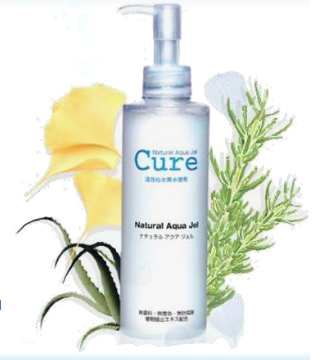 Cure Aqua Gel is described as a natural exfoliating gel, working only to remove dead skin, unlike other chemical peeling gels that can damage skin. By removing dead skin, deep down dirt is removed more efficiently, and it allows for moisturizers to penetrate and be absorbed into our skin better. It's made of 90% water, with the remaining components being derived naturally. 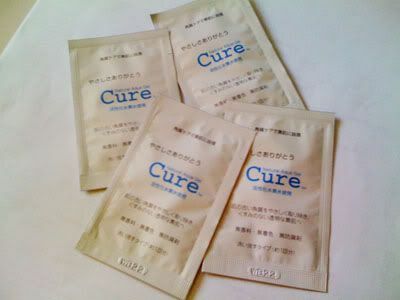 Apparently, it is also Japan's #1 selling skincare product, with 1 bottle sold every 20 seconds. Crazy record, right? It would be strange not to be curious about a product with such claims. So, I've tried this product about 3-4 times already, and I've gotta say I love it! It is a very liquidy consistency. I wouldn't exactly call it a gel, because this is on the runny side. It's a thin, clear liquid that can be applied to skin all over the body. I recommend this for the entire face, and any parts on the body that has visibly dry skin. Anyways, this 'gel' must be applied to a clean, dry face. Massage the face with the product in circular motions, until it dries, and you will slowly feel little balls clumping up on your face (before drying even begins) and on your fingers. What is it exactly? Balls of dead skin! So gross! Afterwards, just rinse the dead skin off, and your face feels so amazingly soft. I use this product once a week, and its perfect for my skincare routine. The only downfall to this is the difficulty in obtaining it, and the high price tag. Each bottle costs $40 CAD, which is a pretty high price tag if the product is used often. But using it once a week, I think it can last a long time, and will be a good investment for skincare. The product is gentle, and will work for all types of skin, which is a great bonus. This product is produced in Asia, and can prove to be a difficult one to track down at a reasonable price. You can definitely check eBay, and doing a quick search on Google will likely find you a couple places as well. There are a couple dupes out where made by other Asian skincare brands as well, but I haven't used any of them, and cannot comment on their effectiveness in comparison. I'm on the lookout, trying to obtain the other ones to try out. Bear with me!